Welcome to the February stop of the Inky Friends Blog Hop called Blending a Year of Cheer. 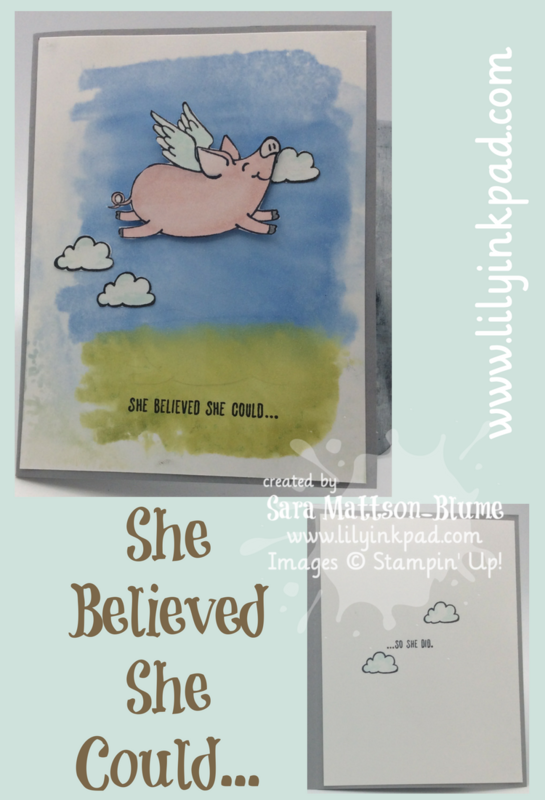 We are celebrating how AWESOME Stampin' Blends alcohol markers are for coloring any project you wish. You may have come from Sarah's January Projects or you could be traveling backwards from Staci's March Projects. Either way, keep clicking onward or backward in a big loop of blogs. We have a full year for you! I decided to make some fun, nontraditional Valentine's first. I just love that pig. I used the Pink Pirouette Light and Dark Blends. I outlined the image in the dark and then filled in with the light. I also added a little Light Crumb Cake on his rump. I also added some light Pool Party around the pig for depth and added Dark Old Olive and Dark Crumb Cake for the ground. Inside, I added a hand-drawn heart for fun. I kept the background simple to accent the pig better. My next card is just as cute. Such a cute pig. I colored it the exact same way. I tried to leave light in patches. It's a skill I'm not great at, but practice makes perfect! This is practice, not perfection. 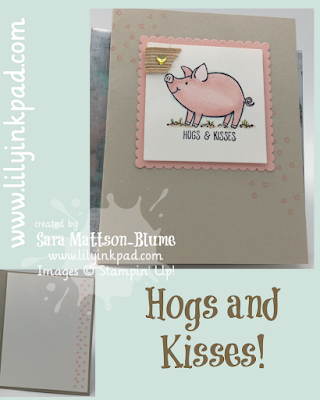 I added some stamped lip prints in a diagonal to draw the eye and also added a border to my card inside of the same. I added the little burlap and enamel heart for some playfulness. I used my markers to color a rough background. I spritzed a my Clear Block F with rubbing alcohol. I then pressed it on the colored cardstock, which allowed the colors to blend into the background and the strokes disappeared. Also, some light and dark patches appeared making the background watercolor-y. 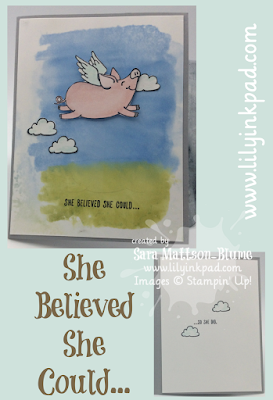 I fussy cut the pig and the clouds, and added them with dimensions. Inside, I finished the sentiment and added some fun clouds. My final project is a gift. I used this wooden piece I bought at the craft store. I stamped directly on the wood and then colored. While the marker was wet, I could smear it, but once it was dry, it is permanent. 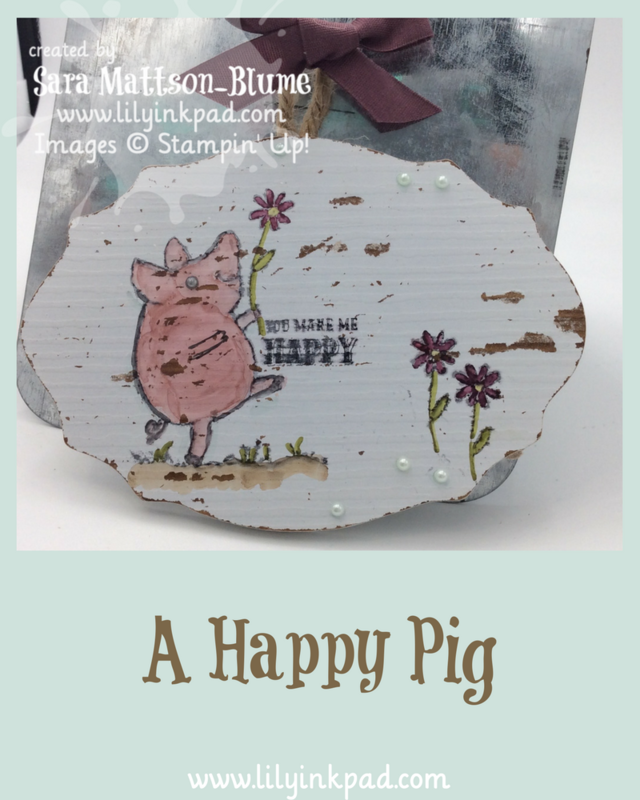 To get multiple flowers, I used washi tape to cover the pig and then inked up the stamp. I removed the tape and then stamped. No other black ink appeared. I also added some pearls for some texture. The distressed part was already a part of the piece. How cute. Well, are you ready for more projects? 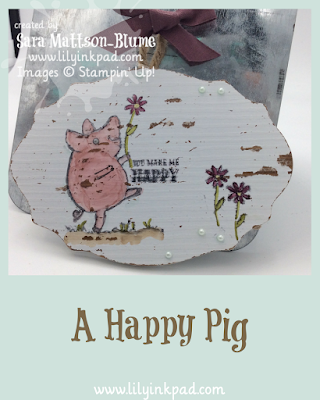 Click Next to visit Staci's March projects or click Previous to see Sarah's January Projects. Happy viewing! Love that you did a non traditional Valentines Day Card. Super cute projects. Thanks for sharing! I love your background wash on the second card. I haven't tried that technique yet. Thanks for sharing that idea. The stamping on your wooden piece turned out so pretty. What a nice gift. Beautiful projects! 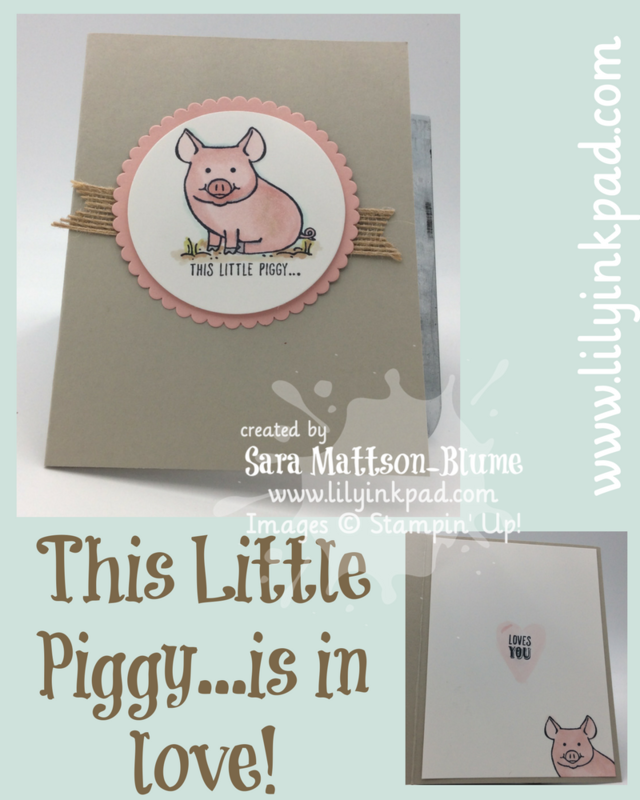 Super cute projects, Sara! You're right, that pink piggie is perfect for Valentine's Day! These are awesome! Love your ideas. Great ideas and oh so cute! I would never have thought of using the markers on wood. Adorable! You did a GREAT job coloring that little piggy. Love all your projects! Adorable little piggies!! Great job coloring and designing!! They are ALL so stinking cute! I love the little piggies, and can't wait to try that technique of the alcohol spritz.